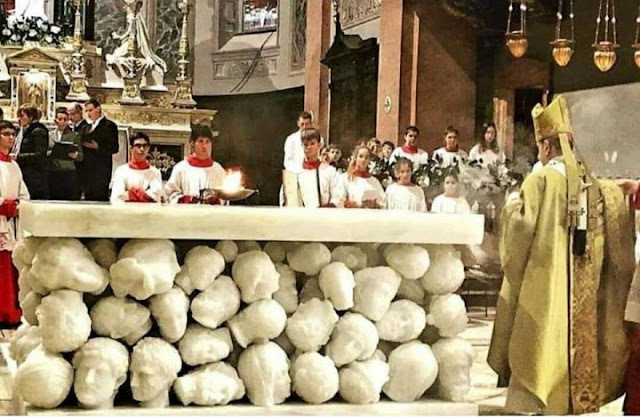 The new altar of the Basilica of Santa Maria Assunta in Gallarate (province of Varese, Italy) is made with 120 sculptures of severed heads. 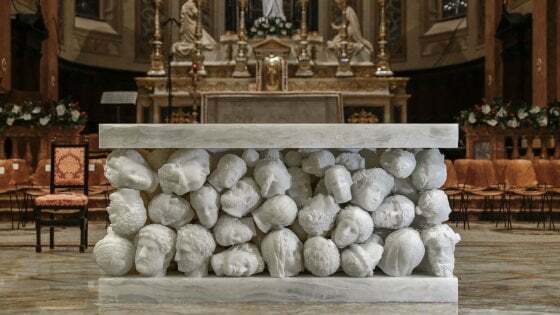 The author of the spooky work is Claudio Parmiggiani (1943), an artist who represents in his sculptural production cut heads of all kinds: departures, bloody, stacked on the pavement.
" On this altar they are all represented. Christians and pagans, saints and sinners. This is the table of the Lord that welcomes all, "said the Archbishop of Milan, Monsignor Mario Delpini, who consecrated the Altar last Sunday. In the pile is the mutilated head of the Madonna of the Pieta by Michelangelo next to that of the gay emperor Hadrian and other heads copied from the work of Bernini, Borromini and Canova with references to classical sculpture to contemporary works. Contemporary desacralization, fostered by the Ecclesiastical Hierarchy, no longer knows limits.